Nominations are now open for the 2019 Risk Award calling for outstanding action which contributes to building resilience of coastal nations and communities exposed to extreme storms, erosion, sea level rise and environmental changes. Projects by an individual or organization may include ecosystem services, disaster resilient infrastructure or capacity building, among others. Supported by Munich Re Foundation, Global Risk Forum and UNISDR, the award will offer €100,000 to the winning project! Read more here. A landscape architect from Thailand created a public park in Bangkok designed to withstand frequent flooding. The park collects water during rainy seasons, which can be used for irrigation during dry seasons. The park’s design demonstrates how cities can combat the effects of climate change. Read more here. 2018 was documented as one of the hottest years in recorded history. A global heat wave affected large parts of Europe and caused crop failures, fires and water depletion. Nature-based solutions, such as better wetlands management, are increasingly being considered as part of future planning against climate extremes. Read more here. The Province of Thua Thien-Hue in Vietnam regularly experiences heavy rainfall events that affect the local community, particularly women, who already experience unstable livelihoods and insufficient capacity to recover from disasters. Ecosystem-based measures are being implemented, such as restoration of urban water bodies and mangroves, to reduce flood risks and support local livelihoods. Read more here. Published by the California Coastal Conservancy in the USA, this study assesses the vulnerability of the State of California`s coastal habitats to sea level rise. A 1.5 meter sea level rise will affect dramatically coastal habitats, biodiversity and protected areas. To adapt to coastal hazards and improve coastal management, the study proposes to focus on the conservation of lands and habitat areas. Read the publication here. Mangroves can decrease the height of waves and help protect the coastal environment and communities from flooding and storm surges. The One Resilient Team aims to enhance green infrastructure for coastal protection, with a recent initiative restoring mangroves in the Philippines to combat flood risk. The team is documenting lessons and challenges to ensuring successful mangrove replanting in order to scale up implementation. See the full video here. 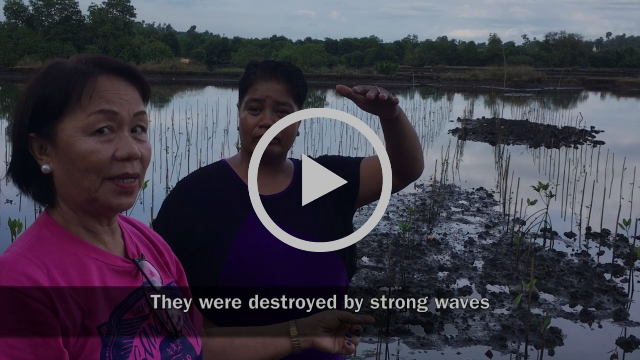 Replanting mangroves to combat flood risk in the Philippines.